A 2019 documentary attempts to open your mind to the possibility of unexplained physics... and perhaps becoming psychic yourself. Call it paraphysics, remote viewing, ESP.... Recently declassified documents now let us investigate why the government [and governments around the world] (taxpayers) have spent so much money on psychics over the years. ..but the film will cost you $9.99 on Amazon. I just watched it. Is the answer quantum nonlocality, entanglement? "Spooky action at a distance" invoked by our brains? Or has dogma got you, as 1973 Nobel Prize in Physics and ESP/consciousness researcher Brian Josephson PhD suggests? Geller's work with Israel's Mossad is openly stated (a fact sidestepped in Phenomena), though the film doesn't go much into his life and work map dowsing for one million pounds a pop for petroleum and mining companies (for a sum of roughly $35.75 million in 2017 dollars according to Jacobsen, p. 332). Numerous proofs of remote viewing are offered. Will you accept the data and investigate, or turn away until the topic is socially acceptable for open discussion? How do you guys ignore remote viewers Pat Price, Joe McMoneagle, and Ingo Swann? 'A large body of reliable experimental evidence points to the inescapable conclusion that extrasensory perception does exist as a real phenomenon,' the CIA concluded in 1975. - Annie Jacobsen, Phenomena, p. 6, quoting the author's FOIA, CIA: "An Overview of Extrasensory Perception," Jan. 27, 1975. Last edited by MattNelson; 14th April 2019 at 11:42 PM. If the CIA was so convinved that remote viewing was real why did they stop trying to use it? A promising method of unhackable, undetectable Mainland-to-submarine communication was abolished due to lack of rabbits. Big deal! In 2019, some of them believe in immaculate concussions: The Real Story Behind the Havana Embassy Mystery. That anyone could take anything associated with Geller seriously..... Taxes belief. Wasn't the SRI testing when they did things like put him in a soundproof room that actually had at least one good sized hole in the wall? I vaguely recall reading that in one book or another. Marks and Kammann found evidence that while at SRI, Geller was allowed to peek through a hole in the laboratory wall separating Geller from the drawings he was being invited to reproduce. The drawings he was asked to reproduce were placed on a wall opposite the peep hole which the investigators Targ and Puthoff had stuffed with cotton gauze. In addition to this error, the investigators had also allowed Geller access to a two-way intercom enabling Geller to listen to the investigators' conversation during the times when they were choosing and/or displaying the target drawings. These basic errors indicate the high importance of ensuring that psychologists, magicians or other people with an in-depth knowledge of perception, who are trained in methods for blocking sensory cues, be present during the testing of psychics. Marks, after evaluating the experiments, wrote that none of Geller's paranormal claims had been demonstrated in scientifically controlled conditions, concluding that "Geller has no psychic ability whatsoever. However, I believe him to be a very clever, well-practiced magician." "If it worked, companies would be using it to make a killing in..."
Curiously the only people earning a living from ESP phenomena are the ones making money from trying to bamboozle mugs into thinking there might be ESP phenomena. A number of years ago, I saw Uri Geller performing his usual magic tricks on an infomercial promoting a psychic phone line. At one point, he used "remote viewing" to reproduce a drawing made by someone on the show. They made a big deal about the guy being a former FBI agent, repeating it over and over, as if it were relevant. Not only was Geller perfectly positioned to read the movements of the end of the pencil as the picture was drawn, the man had eyeglasses with large, extremely reflective lenses. The glare was very noticeable on TV. I'm sure it was just a coincidence that, when the man drew a right triangle, Geller drew a triangle that was a mirror image. To paraphrase Antman, do you just throw the word Quantum in front of anything you want to sound more sciency? It is simple, either it works or it doesn't. As of now the data says it doesn't. By the way, everybody knows the CIA did research through various universities in the 60's and 70's, so this is not a revelation, and simple joins a dozen other books on the subject. Can you really call the guy a nemesis when he went down in an embarrassing blaze of glory on live TV the ONE time he met Randi? More like a speed bump. I have the utmost respect for Mossad, especially their mastery in the use of con-men to achieve results instead of just killing people. I don't know, would you be willing to take "It's not real" as an answer? Easy. The Notre Dam Cathedral in Paris is burning as I write this. Show me the advanced warning from any of these men, and you will have my attention. Ooh, a banned TED Talk. The TED Talk that they don't want you to see! Except for the fact that, as literally anyone who follows your link can see, this was not a TED Talk. It was a lecture by someone who claims that they were supposed to be involved in a TEDx event. TEDx is the minor league of TED Talks. Much more local, not nearly the big names of the TED Talk events. And this wasn't even one of those - it was this guy's own talk, coupled with a claim that he was banned by TED or whatever. My story with TED is a chapter in a tale that involves the cusp we are on between the materialist paradigm that is failing us and the life-sustaining one that is to come. It has to do with the constricting hold the Skeptics have on evolutionary progress, with their tentacles not only into TED but into WIKIPEDIA, too. These are icons of cultural thought and we all are suffering, getting skewed senses of what really matters. Only some “ideas worth spreading” get out at TED, and only some people realize how our understanding is being manipulated. Shhh - the Democrats will take that up as policy. Anybody try the app? I have android. One reason is PSITECH, founded as a privatized version of the program in 1989, "Technical Remote Viewing" they call it. They were a "Pentagon contractor during the first Gulf war," according to the website. They wouldn't tell fibs to sell a product, now, would they! For the amount of screen time (and pages in Jacobsen's book Phenomena), Geller was really not a big player in the important history involving the Army and government agencies. If the "peephole" story is true, forget his SRI video. Apparently there's a bunch of reading involved tunneling to the truth with the skeptics involved. Pin. Definitely a mix of "new age" stuff, but that was the era. Last edited by MattNelson; 15th April 2019 at 08:00 PM. Next you're going to tell me that those dowsing rods sold to the military as mine detectors didn't work. That's an impressively high-quality scam, I must say. Those dowsing rods sold to the military as mine detectors didn't work. …with a serious crime: On June 5, 2002, 14-year old Elizabeth Smart was abducted from her bedroom in Salt Lake City, Utah. The search was extensive. The police spent many hours searching for her. They couldn’t find her. Not a trace, no leads, no suspects. Zip. Zilch. Nada. A company called PSI TECH saw a golden opportunity. PSI TECH claims that, by “utilizing Technical Remote Viewing, an individual can gather information about any person, place, or thing, anywhere in time or space”. On their own initiative, they began a psychic investigation, where they assessed that Elizabeth was killed almost immediately after her abduction. In his agony, Elizabeth’s uncle, Dave Smart, contacted PSI TECH. He had heard of this company, and was snared by their wild claims. The travesty could begin. During the months, PSI TECH issued several statements, describing how their work was progressing. They had already announced that Elizabeth was dead, and that she was killed almost immediately after her abduction. As the months went by, they published more material on their website, so everyone could read for themselves how their investigations went. More and more details emerged, not just about Elizabeth’s condition, but also about her abductor and where to locate her body. On March 12th, 2003, Elizabeth Smart was found alive and well. Her captors were arrested. Not a single thing PSI TECH had claimed turned out to be true. From then on, PSI TECH showed their true color. Almost immediately after Elizabeth was found alive, all material concerning the search for her was removed from the PSI TECH website. Almost. A few, very quick skeptics managed to save some of the material before it was removed. Today, PSI TECH is busy repairing their tainted image with some of the most vile, self-serving crap you will ever read. But, thanks to the quick skeptics, you can read what PSI TECH doesn’t want you to read. The "Talk" was mentioned in passing during the film. Thought I'd share a link. Not familiar with TED! Thanks. Assertion minus evidence equals truth! Quite aside from the capable debunking posted by Norman Alexander, can you shed some light on their track record in the Gulf? Did they find any WMDs? Alternatively, did they spot that there were no WMDs to find? Did they locate Saddam Hussein, or anyone else on the Deck of Cards? Did they locate Bin Laden? Did they uncover any IEDs? I would put good money on the answer to all these questions being 'no'. In Desert Storm the US already knew where Iraq stored it's chemical weapons, and UNSCOM spent the rest of the decade destroying them...all without the use of psychics. In 2004 I debated with a friend who works a US intelligence agency over the location of bin Laden. He was arguing that bin Laden was hiding in the tribal areas somewhere loaded with caves he could escape into should US forces show up. I countered that bin Laden was a city-boy whose "cave" at Tora Bora was more comfortable than my apartment, and based on what we knew about him he was more likely living in a house with high walls, and a covered garden with a volleyball court in the back yard. The only thing Abbottabad didn't have was a volleyball court. I'm not psychic, I made my assessment based on 15 years of stories told about bin Laden, and his down-time. Are you comfortable with using psychics alone for the targeting of air-strikes on suspected terrorist targets? Are you comfortable initiating a SWAT Team assault on a suspect based only on the work of a psychic? Are you comfortable on putting someone in prison based on the sole testimony of a psychic? I don't remember if PSITECH was mentioned in the film. Perhaps this was because of their bad track record, or maybe because their data wasn't available. Being in business for 30 years makes me think they have a product people want to buy. I'll post some of the best examples of remote viewing operations soon, so you don't have to spend the $4.99 to watch or $9.99 to buy. Being in business for 30 years makes me think they have a product people want to buy. Maybe you should check out the Brilliant Light and Power thread for a counter-example. When you look at paranormal scams the gap between the enthusiasm of the buyers and the absence of functional deliverables becomes even wider and more widespread. Many people are easily fooled, and most easily fooled by con men offering what their marks wish were true. People have been buying useless homeopathic remedies for over 200 years. I must say it's hilarious the evidence I just found for you guys. I'm a vegetarian who eats eggs, so bear with me. This example of remote viewing comes again from Stanford, not the military. Chronologically, it's a good start. Influentially it's not a good choice, I discover after some due diligence. It's one of few clips from the film Third Eye Spies on YouTube... posted by the director. 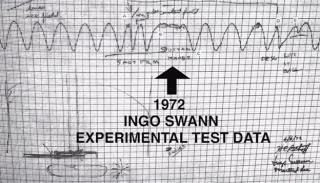 Using this link we can skip the random Stanford drawings of Ingo Swann and go to his drawing the classified design of a magnetometer buried under "30 feet" of concrete. The other main claim is that he moved the "unswayable" needle. I'm starting to see the problem. Until we see them happen ourselves, these are claims. The film doesn't give many details at all. We can easily wonder if maybe the scientists figured a way to rig the "superconducting quantum interference device (SQUID)" so they could be successful at something. Annie Jacobsen (in Phenomena, who unlike the film mentions SQUID specifically) says it was in the basement of the Stanford Varian Physics Hall (p. 131). Apparently there were 9 witnesses including SRI's Hal Puthoff who brought Swann, and a Dr. Arthur Hebard, of the Stanford High Energy Physics Laboratory, Dr. Martin Lee of the Stanford Linear Accelerator Center (SLAC), and six doctoral candidates. Interestingly from a skeptics perspective Jacobsen says "Puthoff had told Swann what to expect," (p. 132) but when Swann finds out the the magnetometer was (only) 5 feet below, buried in concrete... he got angry and frustrated. He had no effect on the magnetometer for several minutes. Then he asked for paper, began "probing" with his mind, and drew. "As he spoke, the pen on the chart recorder gave a small jerk. 'All eyes went to the machine,' Puthoff recalls. The recording pen stopped and started moving again. Somebody apparently mumbled "Jesus Christ," then they asked him to do it again, so Swann supposedly did. Then Drs. Lee and Hebard signed the chart paper as witnesses. One of the doctoral students allegedly freaked out and left the room. "The only thing ever written about this magnetometer was that it contained what was called a Josephson junction -- two layers of superconducting material sandwiching a thin layer of non-superconducting material. (The configuration was named for the British theoretical physicist Brian D. Josephson, who won the Nobel Prize in Physics in 1973 and became a vocal proponent of extrasensory perception.)" Sorry, but I'm not matching a drawing with anything. The wavy line and its perturbed section came from the SQUID, it seems to imply. However, the drawing was supposed to be made before the needle movement. Maybe the image was superimposed with both. Who knows. 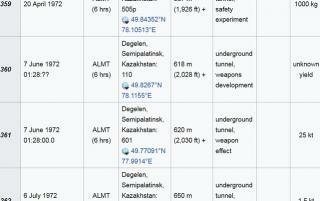 The psychokinesis of disturbing the magnetometer may not be authentic according to what I just found when looking up the historical list of Russian nukes. I think the time is off, but this requires further discussion. Remember the SQUID was supposed to be able to "sniff out nuclear explosions" according to the film. Maybe not around the world. I don't know the details. It's interesting, at least. Compare the dates. 6/6/72 on the "Swann-influenced" SQUID chart/drawing and 6/7/72 at 7:28 (AM, adjusting according to Universal Time, feel free to check my work) in Kazakhstan... which is 13 hours ahead. The time of the Swann miracle is unknown, but Jacobsen says that Puthoff and Swann came back several hours later to confirm nothing was wrong with the magnetometer... "that night." But several hours after 6:28 PM? No further disturbances were reported after Swann left. But if they came back "that night" there should have been a disturbance then, if it could sense nuclear explosions in Russia. Maybe a coincidence? The closest U.S. test was June 7, 1972 15:20:00. The earliest RV (More accurately Remote Sensing) experiment verified the existence of RV phenomenon related subatomic particles. Legendary RV pioneer Ingo Swann, upon request, sent such subatomic particles into an underground shielded Magnetometer. This kicked off the, (sic) military-involved but never classified, Controlled Remote Viewing Program at Stanford. The SRI remote viewers were studied by top physicists. Ingo Swann and Uri Geller surprised Nobel laureate Brian Josephson, who first developed the Josephson junction, the basis for measuring biomagnetism. Both of them managed to deflect the SQUID [the needle on the chart recorder] to such a degree that Josephson, like Evan Harris Walker, suggested that physics needs to adopt a new paradigm to incorporate hidden variables and universal intelligence. "He then startled the three scientists present, who included the designer of the Squid, by announcing that he could actually see the workings of the instrument. He promptly made a sketch to prove it. ‘Oh my God,’ said one of the scientists. ‘That’s the thing I just took out a patent on. Nobody is supposed to know about that.’ Then followed a period in which ‘the frequency of the oscillation doubled for about thirty seconds’, as Puthoff described it. This is plainly visible on the chart recording published in Mind-Reach, the section in question being signed by Swann, Puthoff and physicist Dr Martin J. Lee." I can't find the Mind-Reach image. ..."and that got the attention of the CIA." - "Third Eye Spies"
Puthoff was approached by two men from the CIA who according to Jacobsen p. 135 had "'a copy of my magnetometer experiment report' in hand." They wanted him to work with ESP in an official capacity, inviting Swann back for more testing. After many tests involving drawing things that were hidden from Swann, CIA awarded a $49,909 contract for an eight-month research project which was classified secret (p. 136). Last edited by MattNelson; 17th April 2019 at 08:28 PM. Did any of the people involved have any experience in properly designing a remote-viewing test? If my dentist swears an oath that he detected muons emanating from my armpit, are we supposed to believe him because he has a doctorate in teeth? 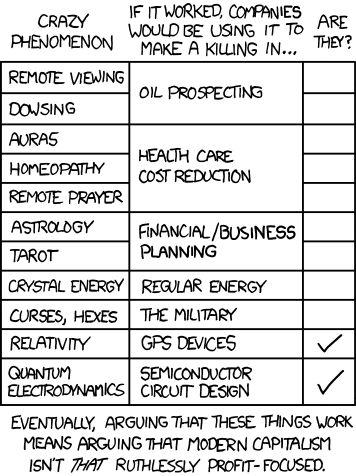 Post examples of properly controlled, falsifiable, repeatable experiments whose terms of success have been defined beforehand. Otherwise, cool story, bro. Leeches and mercury cured all sorts of ailments before science tested them properly. The scientific method exists for a reason. I like 'The men who stare at goats' better. OP maybe you can answer this one, It always seems to get avoided. Can I get pink eye in my 3rd eye? Last edited by Nay_Sayer; 17th April 2019 at 10:51 PM. Did they stop using it? Are you sure? Hmm. But I'm safe right? I have my house triple layered in aluminum foil. No, the orbital lasers will burn right through that in a second. You need my patented Brainimaginator 3000, which you can buy from my website for the low low price of $452.74. Have you heard of confirmation bias and subjective validation, MattNelson? These well known and well understood cognitive biases are the reason why the scientific method had to be invented. Here's an article on remote viewing by someone who understands this. A test protocol which does not take these biases into account is worthless, and none of the anecdotes you've so far posted qualify. In order to convince sceptics to take claims for remote viewing seriously scientific evidence for its accuracy - properly designed, blinded tests with statistically significant results - needs to be produced. No such evidence exists, which is why the sceptics here are unimpressed with your anecdotes.